Building insulation plays an integral role in the energy efficiency of homes and buildings and in turn their environmental impacts. Most consumers today want to know how green the materials are that go into their homes and buildings. 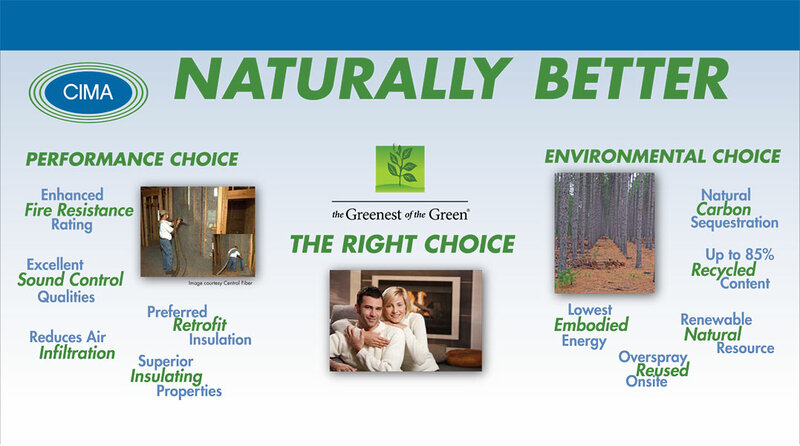 When it comes to insulation products, cellulose insulation is the Greenest Of The Green®. Cellulose insulation has the highest level of recycled content in the building insulation industry - up to 85%. Cellulose insulation is made with recycled paper—paper that might otherwise end up in a landfill. By comparison, Fiberglass insulation has a maximum of 40% recycled content and foam products little or none. Cellulose insulation, by utilizing recycled paper, helps prevent the release of the greenhouse gas methane which would result if that same paper were sent to a landfill to decompose. Cellulose insulation scrap is recovered and recycled on-site. Fiberglass and foam insulation residue goes to landfills where it remains forever as waste since neither will ever decompose. Cellulose insulation is regionally produced. Using local recycling programs and independent recyclers, and servicing communities close to home, brings new meaning to the slogan "Think Globally, Act Locally." Learn more about the environmental characteristics and benefits of cellulose insulation and how it compares with other types of insulation to see the differences. Cellulose is the clear leader when it comes to environmentally friendly building products.